Everyone who comes in to us seeking hypothyroidism treatment is also suffering from other health issues as the result of the thyroid problems. Hypothyroidism symptoms include include fatigue and poor concentration, weight gain, constipation and hair loss. But hypothyroidism natural treatment is entirely possible. 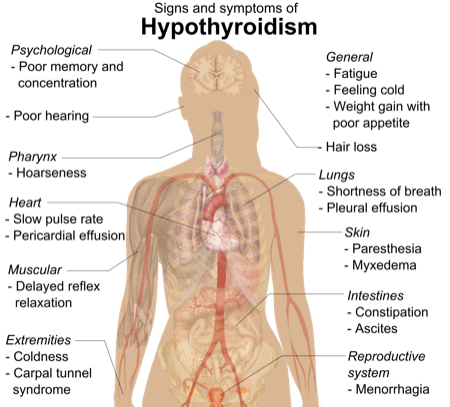 Here are some tips from a couple of the naturopathic doctors in our Toronto clinic who have worked with a lot of thyroid problems. Proper testing. Most people are tested for TSH, which is Thyroid Stimulating Hormone. What they don’t often do is test T3 and T4, which are your thyroid hormones, and they don’t always test antibodies. A good place to start is just to figure out do you have Hashimoto’s or not. Then the cause is totally different. Hypothyroidism triggers. Genetic stuff is one thing. Past infections, which is really interesting, can be a trigger. Leaky gut can be a trigger. Female hormone imbalance I find sometimes, like after pregnancy or if someone has a long history of period problems, that kind of thing, sometimes underlies it. Sometimes, history of allergy or other immune system stuff can underlie it. And adrenal function, that’s the other one. Lots of stress, or stress over a long period of time, or exhaustion or other illness. Avoiding gluten and caffeine. For some people going gluten-free makes a huge difference in their thyroid function and brings down the antibodies. It stops the destruction of the thyroid gland, and then their symptoms improve and their medication works better. Coffee and caffeine can also affect how well thyroid hormones work. I’ve had a patient where we went gluten-free, caffeine-free as part of our treatment and that had a lot of effect for her. Stress management. Changing the stress response or working on adrenal support, more sleep, stress reduction, balancing go-go-go with more calm or more downtime. That can reduce thyroid antibodies. Drainage. I do a lot of what’s called drainage, to change the immune system and stop the autoimmune attack, and if you can do that, then often someone can feel better, it’ll just take time to see it reflected in the labs. Success story. Naturopathic methods can bring relief within a few months. Dr. Whimster treated a woman who wondered why her thyroid medication was continuously going up. Dr. Whimster determined that the woman had Hashimoto’s thyroid antibodies and so advised her on what would be a healthy diet for her, including going gluten free, caffeine free and taking supplements. She also did drainage and detoxification for her. The woman was able to decrease her thyroid medication and even get pregnant, which she hadn’t been able to do. Supplements and diet. There are supplements that we can give you to allow for the thyroid medication to work better, or changes in the diet for example. We have seen that in cases of hypothyroidism that might be coming from an immune problem, cutting gluten from the diet could be beneficial.